Oh. My. Goodness. It has been over a year since I have been looking forward to Molly & Scott's wedding. I knew through our email correspondence that these two love birds planning their wedding "from away" were perfect for me. Their vision of their wedding day and their story of meeting at City Year had me hook line and sinker. I met them in October of last year at Two Lights State Park for their engagement session and spent a few hours exploring the rocky coastline with them. It made me want to fast forward to this past weekend even faster! They are such an adorable, kind hearted couple! And then this past weekend was finally here. I dare say it was not the fall weather that they envisioned when they opted for mid-September in Maine as we were tackling recording breaking heat in the state. Yet the clear blue skies were a welcome site versus the rain in the southern states. I caught up with Molly & Scott and their bridal party at Jai Yoga in Brunswick as they relieved any lingering tension from their travels to Maine (or, you know, planning a wedding). Although it was my first bridal party yoga session, I certainly hope it isn't my last. What a fantastic way to start the day! The rest of the day was sensory overload and such an incredible story that is hard to put into words. Their dried floral arrangements from The Flower Patch had me taking deep breaths all day to take in their amazing scent. The gorgeous lace of her gown was absolutely stunning. 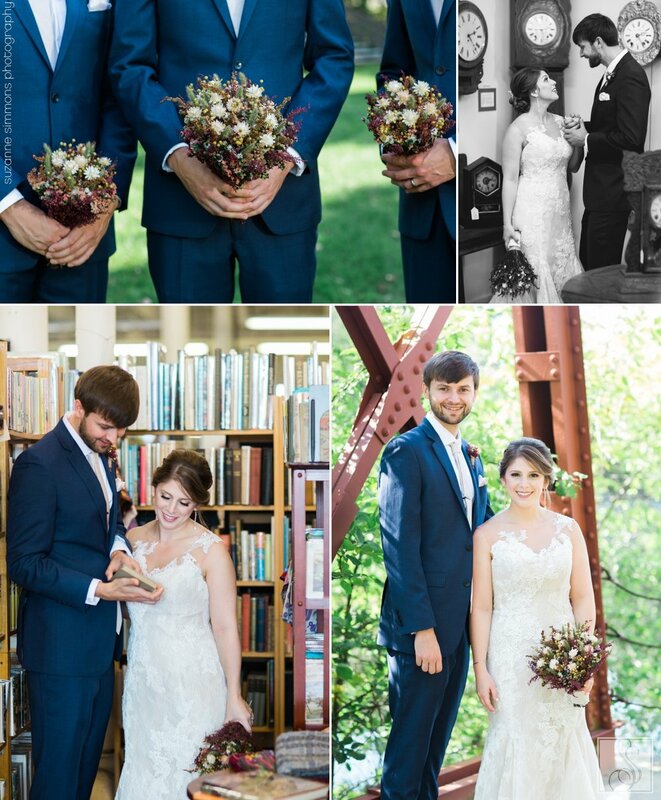 The history and story behind the Andross Mill Complex, where we capture some of their portraits and their reception was held, added another layer to the story. We could hear the river behind them as they tied the knot at Brunswick's Anniversary Park. 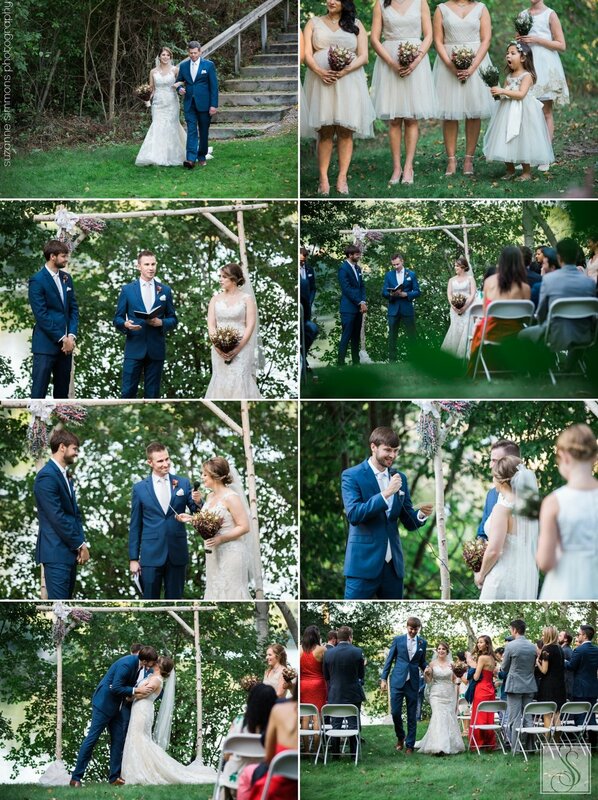 Then there was the added layer of their guests introducing themselves to each other during their ceremony (such an awesome idea). Sealed with a kiss and Scott & Molly were officially husband & wife at long last. Ready to celebrate, the newlyweds and their beloved guests practically skipped with joy over to Frontier. Once there, they feasted on a plethora of delicious plates of food (they honestly have amazing food!) and amazing looking whoopie pies from right down the road at Wild Oats Bakery and Cafe. With their sugar spiked, they danced long into the night with the Silver Arrow Band at the helm. It was an absolutely incredible day and one that I dare say no one in attendance will ever be able to forget. Molly & Scott, thank you thank you thank you. I am so lucky to have captured this time in your lives. Thank you for trusting me to tell the story. It was absolutely incredible.